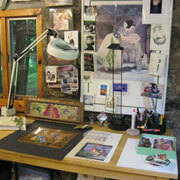 Our first Open Studio Tour took place on June 28th from 10 -5. Attendees met at Arts on the Lake to pick up their maps for the self-guided tour and then headed out for the day. Guests signed up for the tour at the Arts Center and received a map with a route to each open artist's studio and a badge to let artists know who they are. There were also two artists inside the arts center, Pal Gyomai and Ed Dabronski. 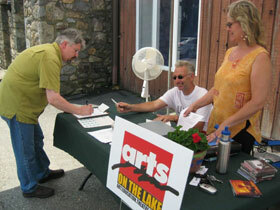 Guest signing up for the tour at Arts on the Lake. Participating artists: Ed Dabronski, Harvey Ehrlich, Pal Gyomai, Bob and Bertha and Dina Herrmann, Bruce Iacono, Michael Keropian, Deb Lecce, Bill Ullman and Roy Volpe. Photos courtesy of Jeff Green and Chris Casaburi.